Revelation 12:1-5 may have been fulfilled on 9/30/2011, on the first day of the Jewish Feast of Trumpets (But see The Dragon and the Manchild of 2040). As for the 2011 fulfillment, if following the Feast of Trumpets earth were to see “stars” falling from the sky, this could pass as a sign of the fulfillment of the subsequent verses in the passage: Rev. 12:7-9. These follow-up verses describe a war in heaven in which the rebel angels are cast as stars down from the heavens to the earth, unable to return. 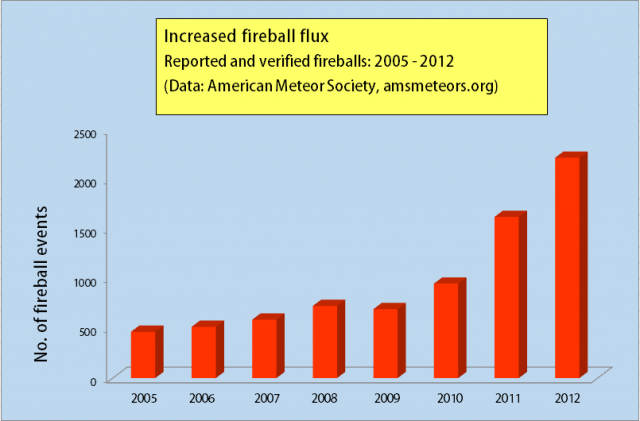 And from the fall of 2013, NASA: Increasing Numbers Of Meteorites Bringing Life Forms To Earth, and December 2013: American Meteor Society Data Proves 100% Fireball Increase! – The 5 year numbers are closing in on a 1000% increase. In January of 2013 sightings continued picking up, and by February of 2013 folks were starting to notice. The orbit of comet Elenin crossed Earth’s orbit on October 16, 22 million miles ahead of earth. Subsequent to that, earth passed into the area of its tail. In this also, Elenin was a non-event although there were some meteor sightings, and on 11/8,9 there was the near-earth fly-by of the asteroid 2005 YU55 (measuring 175 meters across), traveling right behind the elenin orbit. But would meteorites falling from space serve as the appropriate sign of angels falling as stars from heaven? Consider the mythos. Meteorites were commonly worshiped in the ancient world as the bodies or vessels of gods who had descended from the sky – as the “image” of the god. A late expression of this in the ancient world was the worship of Kybele, prominent throughout the Roman empire. She was worshiped through “a small dark sacred stone not formed into any iconographic image that had fallen to the shrine of Pessinous from the sky.” This cult prospered in “every town and village” of the empire until the fifth century, when the stone was lost (“In Search of God the Mother,” Roller’ p.265; and “Cybele and Attis,” Vermaseren). The ancient Greeks worshiped their goddess Artemis through an image of her that fell down from heaven (Acts 19:35). The Arabs worshiped their goddess, Allat in this same way; and in fact Muslims to this day worship Allah through the black “meteorite stone image in Mecca” (“God’s War on Terror,” Shoebat and Richardson). So, are meteorite sightings potentially germaine to the rebel angels being cast to earth in Revelaion 12:7-9? You betcha! Meteorites that serve as vessels for living beings are thought of as a special class having specific characteristics, and are sometimes referred to by the ancient term, merkabah. As you might expect, New Age mystics are very interested in the ascent and descent of beings via merkabah. In an interesting parallel to the biblical description of the casting down of the rebel angels to the earth in Rev. 12:7-9, in the fall of 2011 new age “channellers” were saying that Elenin was a transdimensional ship carrying ascended masters and that the first wave of these ascended masters was expected to arrive on earth between 10/16 and 11/11. According to new age doctrine, they would not bring tribulation, but jubilation and ascension. With the First Wave of Ascended Masters, the Time of Revelations will begin. … The collapse of the financial system, the stronghold of these dark forces, will precede this event and will contribute to (the) demise and expose (of the world’s present hidden rulers). Here is a little on the existence of trans-dimensional portals in ancient times. The time-frame of Elenin’s 9/11 perihelion and its closest approach to earth, on 11/9, is considered in this school of thought to be the calendar equivalent (19.5 degrees from the end of the circle of the year) to the 19.5 degree latitude (the latitude that the three points at the base of a tetrahedron transcribed by a sphere touch its surface). These points, and so these degrees, dates, and numbers are thought to express and involve transdimensional energies and can be used to open portals between the physical and other dimensions. Elenin, perhaps due to these dates, and due to purported earthquakes occurring the several times it lined up with the earth and the sun as it was inbound, became a big doomsday flap. Doom that never materialized, leaving only discredit for the fear-mongers and the New Agers in its wake. But for these New Agers the passing of Elenin is as significant as the birth of the Manchild is to Christians. Really it represents a messianic hope that for them displaces the Christian hope. Whatever Elenin was, it served to divert attention from the fulfillment of the woman clothed with the sun travailing to bring forth the manchild. God said He would “come as a thief in the night” (1 Thess. 5:2). … In the City of Angels. On November 11, 12, and 13, 2011, one of the most powerful crystal skull events in the world will take place in Los Angeles. The opening of this Mayan portal of planetary rebirth is associated with potentially cataclysmic events and precede the “end” of their calendar the following year “on” 12/21/2012. These ideas have clear apocalyptic and messianic overtones that run in competition with the Christian apocalypse. Pilgrimage 13 Crystal Skulls: Final Report by Kashonia on December 4, 2011 wraps up this event. If 9/30/2011 was the fulfillment of the astronomical sign of the woman clothed with the sun in travail to give birth to the manchild, we have entered the time of that birthing and of the casting down to earth of the spirit of antichrist and his minions, of the testimony of the two witnesses in Revelation chapter 11, and of the return of Jesus Christ and the start of His millennial reign on earth. Satan and his angels are cast down and the woman flees to the wilderness where she lives “in hiding” for 3 1/2 years. If you wish to discuss this subject seriously, then you must divest yourself and this article of any New Age references. All New Age philosophy comes from the Illuminati via Theosophy, and anything that comes from the Illuminati is part of the Great Deception !! !